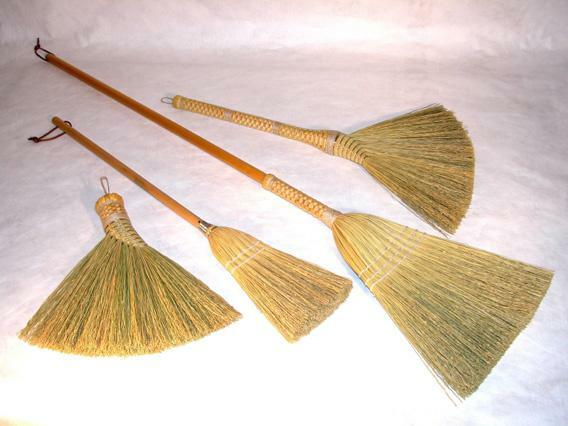 Broom history: How it became flat. A history of the sturdy household essential. 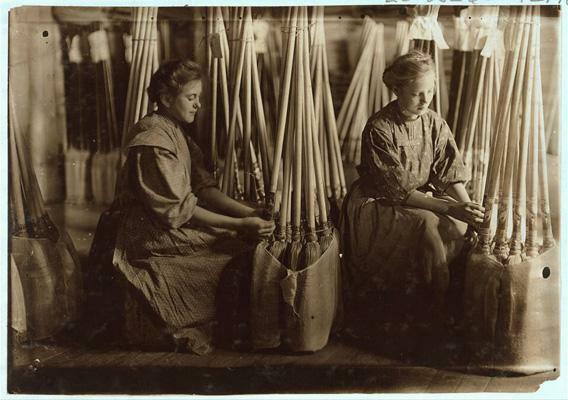 Girls packing brooms in Evansville, Ind. in 1908. Among the family of housekeeping implements, the broom—humble, deceptively simple in design, prone to leaning unobtrusively in corners—does not often enjoy the recognition it deserves. Household cleanliness begins and ends at the tips of a broom’s fibers, whether they’re natural or synthetic. A good, stiff bundle of stick and straw can make equally easy work of a crumb-strewn kitchen or a porch sagging with the weight of autumn leaves. Even at this late, Swiffer-and-vacuum-dominated date, the broom continues to be essential for anyone truly committed to the fight against filth: No assemblage of electrostatic microfibers or carefully-engineered vortex chambers can replace the feeling of sweeping, the quiet force tempered with elegant control that reverberates upward from bristle to hand. But who invented the broom? And why does it work the way it works? Brooms were not always flat. Before the 19th century, broom-making was an idiosyncratic art; most were fashioned at home from whatever materials were at hand. The basic design involved binding the sweeping bundle to a wooden stick with rope or linen twine. However, these homespun brooms had short lives and had to be replaced often. The professionalization of broom-making appears to have begun in Anglo-Saxon England, where artisans known as “besom squires” in the southeastern region would take twigs from the many birch trees in the area, trim and then lash them to poles of chestnut and other woods. A bawdy 18th-century folk song called “The Besom Maker” makes fun of a female besom maker’s need to search the local woods for materials, and, along the way, other pleasures. The British broom trade of this region would continue for centuries alongside the various homemade techniques, and some practitioners still make brooms today, working as heritage craftspeople. 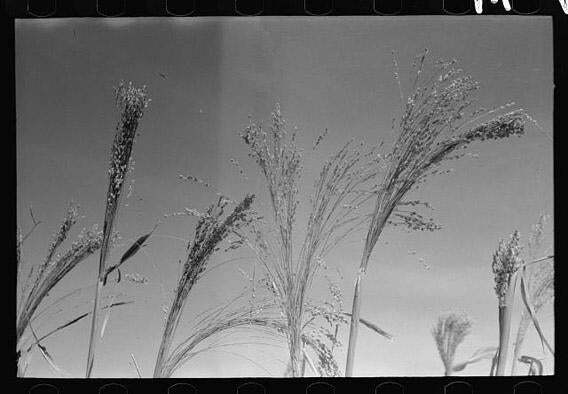 Broomcorn in Baca County, Colorado. Modern broom-making truly began, however, with the rise in cultivation of a previously underappreciated crop that would soon be called “broomcorn.” A species of tasseled grass (sorghum vulgare) that somewhat resembles the sweet corn plant, broomcorn’s seeds and fibers had previously been used for animal feed and not much else. Then, according to historian Gregory H. Nobles, in 1797, a farmer from Hadley, Mass., named Levi Dickinson had the idea to use the grass to make a broom for his wife, as well as a few extra to peddle to neighbors. His broom—a round bundle of broomcorn lashed to a stick with some weaving around the top—proved to be more durable and effective than previous models, and it was soon in demand around the region. By 1800, Dickinson and his sons were making several hundred brooms a year to sell throughout the northeastern United States. Ad for a broom machine ad in the Broom Maker, Vol. 8 by International Broom and Brush Makers’ Union, 1906. Other farmers quickly planted acres of broomcorn and joined the trade, as broom cultivation and construction was a fairly simple side-job that could fit easily into the pre-established rhythms of agricultural life. By the first few decades of the 19th century, a number of versions of the “broom machine”—a set of vices, clamps and a foot treadle (essentially a tension apparatus that uses the broom-maker’s feet to keep a roll of twine taut as he winds it around the broom corn)—had been developed that made broom manufacturing even quicker. A variety of brooms made to reflect variations in style found in early 19th century Shaker flat brooms. It was the Shakers, a Christian religious sect centered in the Northeast and revered for their facility with handicrafts, who made the broom flat. The Shaker intervention—the only major update to the broom since the introduction of the broom machine—was simple but ingenious: Instead of lashing the broomcorn in a round bundle to the handle, they found that securing the corn with wire, flattening it with a vice and sewing it tight resulted in superior cleaning tool. Flat brooms offered increased control over the broom’s motion and a broadened surface area. (The Shakers also pioneered the smaller whisk broom, perfect for one-handed dusting and sweeping of higher surfaces). It’s likely that the broom in your closet today (assuming it’s not synthetic) bears almost exactly this same design. With the advent of the broom machine and the Shaker design, broom-making’s popularity spread rapidly across the United States, reaching its apex around 1850 when more than 1 million brooms were being constructed each year in Massachusetts alone, and being sold as far away as South America. 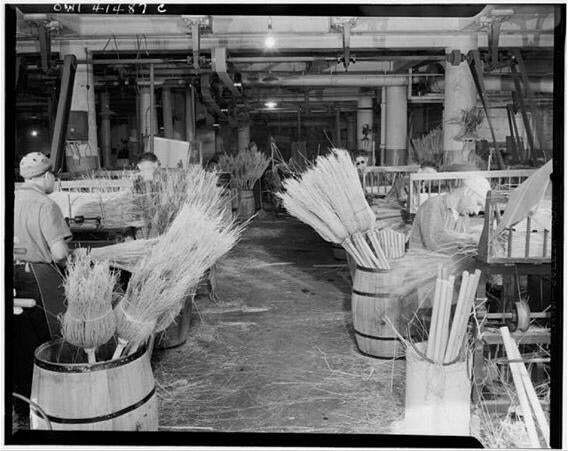 A 1944 New York broom production facility for the Army and Navy. Photo by Richard Boyer/Library of Congress. Eventually, broom-making followed national expansion to the western states, where broomcorn was considered to grow better. By the turn of the 20th century, the industry had significantly declined in the Northeast. Following the larger trends of industrialization in all trades, small broom shops in the United States gradually expanded into factories to meet demand, their manufacturing techniques continuing to require skilled, hands-on labor, until 1994, when NAFTA made Mexican brooms cheaper and forced many American outfits to close. Currently, most of the United States’ natural fiber brooms come from south of the border, with only a few local makers remaining. This is not always the shape people associated with the word broom. Perhaps the biggest change in the broom world over the last century is the rise of the synthetic lookalike. Following the development of the first synthetic fibers in the 1940s, companies like DuPont started creating filaments and extruded plastic products just in time for the consumer boom of the 1950s and 60s. 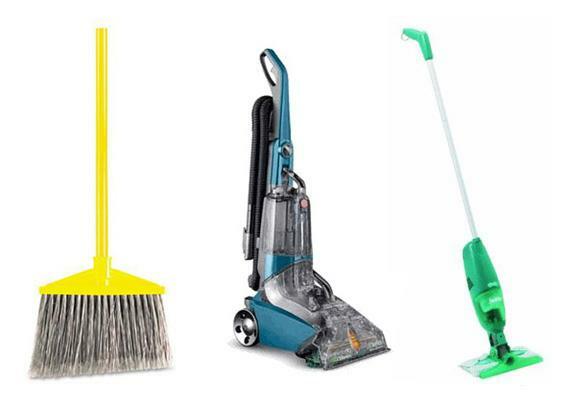 These technologies were quickly adapted for brooms—especially the school janitor-size, “push” broom varieties—and these styles continue to sell alongside the old natural models today. Many homeowners keep one of each on hand, using the softer, plastic bristles on sensitive hardwoods and the hardier broomcorn for heavier jobs. Rubbermaid Regular Stain Resistant Bristles Angle Broom; Hoover FH50220 Max Extract 60 Blue Carpet Cleaner; Swiffer Sweep & Vac by Procter & Gamble 04815. The modern homemaker can choose from a range of implements to clean his floors, including synthetic brooms, the constantly metastasizing Swiffer product line, and, of course, the vacuum cleaner. 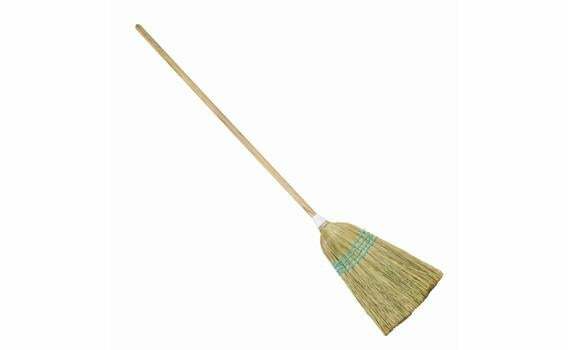 The last of these is highly effective at certain tasks (especially the cleaning of carpets), but most American homes still keep an old-fashioned broom around for its unfailing dependability. 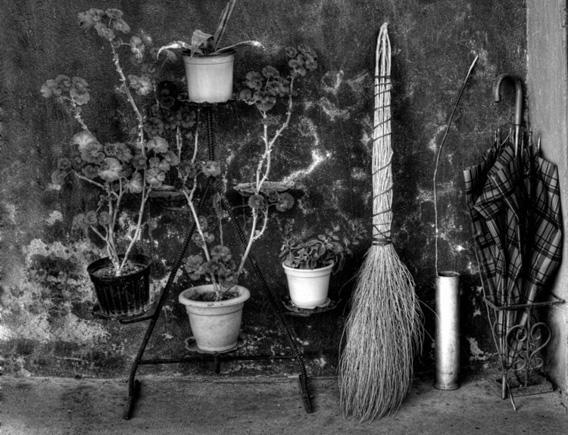 For a household item essentially perfected in its design so many decades ago, the broom’s staying power—both as a cleaning tool and cultural symbol of neat domestic tranquility—is remarkable and deserved. And then there’s just the question of aesthetics: A sturdy broom looks a whole lot nicer than a dirty napkin on flimsy plastic stick.